It is an all too common paradox: you need to capture transient events at a high sample rate but the events of interest are erratically spread over a long period. The OM-CP-PRTRANSIS is the pressure recorder to solve your problems. It samples up to 100 Hz (10 ms), but it will only trigger on pressure limits that you set beforehand. You can start the trigger on high and/or low thresholds and end it after either a chosen number of samples, or when the signal crosses over your stop threshold. The device can record up to 255 events and take as many as 262,143 pressure samples. The recorder also shows up to 32 samples of "pre-trigger" data so that you can learn what caused the trigger in the first place. The OM-CP-PRTRANSIS has been Factory Mutual certified as intrinsically safe for Class I, Division 1, Groups A, B, C and D and nonincendive for Class I, Division 2, Groups A, B, C and D. This certification makes the device ideal for use in hostile environments. 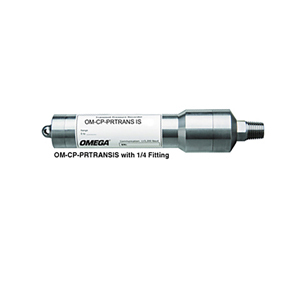 The OM-CP-PRTRANSIS is a battery-operated unit with a standard 1/4 NPT for easy coupling to your pressure systems, and the stainless steel sensor can measure the pressure of most common fluids and gases. The non-volatile memory will retain valuable data even if the user-replaceable battery becomes discharged. The software converts your PC into a real-time strip chart recorder. Data can be printed in a graphic or tabular format and can be exported to a text or Microsoft file. The OM-CP-PRTRANSIS is your solution to the transient pressure problem. Division 2, Groups A, B, C and D.
참고: Operator’s manual and USB interface cable are included with the OM-CP-IFC200 Windows software (software sold separately). To order data logger with NIST calibration certificate, add suffix "-CERT" to model number.